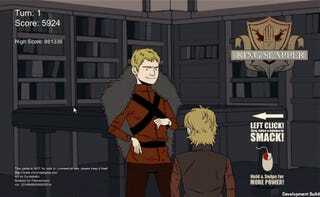 Game Of Thrones Game Has You Slapping Joffrey. A Lot. Remember those sweet Game of Thrones fighting game images? Well, while that'll (likely) never happen, we can now play the next best thing. Artist Roberto Flores, whose 2D fighting take on Westeros was so damn good, has teamed up with friends Albert Li and Alex Shum to make King Slapper. It's very much in the same vein as Rose & Camellia, in that you wind your mouse back and give someone a good slap. Only this time it's Joffrey. You can play it right now, right here.